TransWorld Park Poll 2017-18 - Grouse Parks Needs You! Everyone here are at Grouseparks.com hopes that your already digging deep into your summer time activities. Maybe some of you have had the chance to enjoy this beautiful weather we've been getting lately and have gone for skate? Or maybe a quick trip to the island for some much needed surfing? Whatever the case maybe, the time has arrived, and once again its time to vote for your favourite park. "The investment in and presence of a thriving terrain park is perhaps the strongest indicator of a resort’s dedication to snowboarding. Freestyle terrain is an incubator for progression, which pushes snowboarding as a whole. We’ve partnered with Snow Park Technologies to determine the top North American parks through the TransWorld SNOWboarding Park Poll, but we need you to help us in sorting the best from the rest." TransWorld SNOWboarding Magazine needs your help deciding which mountain in North America has the best parks! TransWorld wants to hook you up for your effort and time, they got five boards to giveaway to some lucky constants, including a 2018 CAPiTA Outerspace Living or Paradise, a Never Summer Funslinger or Infinity, or a RIDE Warping. WOW! So Click the link here and vote for Grouse Mountain. Unidentified Rasta had some of the greasiest lines of the day. Respect. ...0 to 100. Day 1 at Grouse Park. I think we were all caught off guard yesterday when Grouse announced they'd be open for Day 1 of skiing and riding this Saturday. The weather has been cold but pretty dry. It's been cold enough though to make snow and Grouse blew a patch big enough for Marcus Cartwright and his crew to install a park and BOOM! park riding season is on at Grouse Mountain. All the usual suspects plus crews down from Whistler (not open for riding yet), Nuulife, and Footy Fiend turned up and turnt up! Here are a collection of shots from Day 1. The tricks and faces showing up at Grouse Park. Stay tuned to the blog for more photos and video edits dropping soon! Grouse Park introduced the North Shore's first concrete feature bringing a real street feel to the park on Day 1 and all the features were fresh out of the shop and as smooth as an A$AP verse. Braedon Wheeler was a Day 1 standout putting together some of the sickest lines on the down bar to concrete ledge. Grouse Park Crew where on it maintaining as was John Swystum from Nuulife Cinema maintaining behind and in front of the camera. Firecrackers allowed. So is 'hands in the pockets' steeze. Braedon Wheeler putting on a clinic. Hey, I'm Cole Graham. I made a few posts on the Grouse Park blog last season, and this season I am back. I'll be bringing you hype video edits. I started filming 3 or 4 years ago skiing with my friends while using a little handycam. I'm from Tsawwassen, BC. You can check out some of my edits on my Youtube Channel. In my first post I have a video that I filmed early season in the Paradise Jib Park after work one night with some friends. Enjoy! What's up! I'm Kaz Yamamura, and I'm super stoked to be on the blog team for the 2013/2014 season. I'm a student at BCIT, and have a passion for photography. During my free time you can find me on the slopes, whether it be riding, taking photos or helping blogger Andrew Santos with an edit. I've been shooting for four years and I usually spend my time shooting action sports. I mainly shoot mountain biking, snowboarding and skiing, but I do like to dwell in other areas as well, including product photography. I'm excited to be pumping out photos for the blog. Here are some shots I took in the past year. 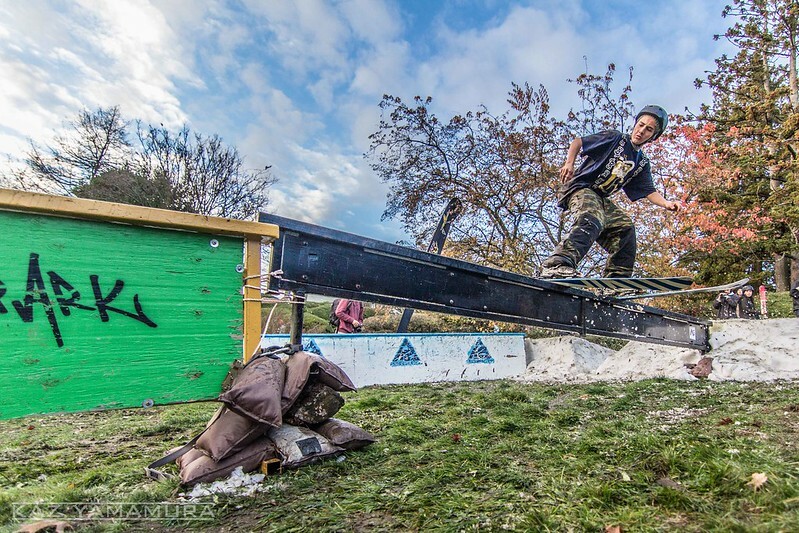 Louis Garoz Ferguson at the UBC Rail Jam. Were you at the event? If that's not enough to get your fill, you can check out all my works on my Flickr page, and sneak peeks of upcoming photo series on my Instagram.